“But you already know how to cook,” said friends when I told them I was going on a 5-day cooking course, “and you already live in France. So why go to Cook in France?” Well, I’d been following Jim on Twitter for ages because of his sense of humour and lovely pictures of food. So when he tweeted a late availability discount for his first course of the year, my fingers zinged towards the mouse and fired off an email. A week later, I was there. 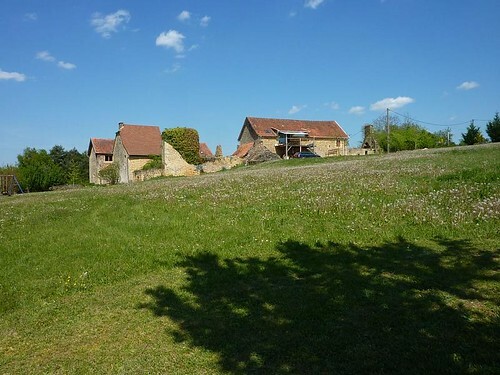 One thing Jim’s otherwise informative website doesn’t prepare you for is what a beautiful place Bombel is — romantic honey-coloured stone buildings on top of a hill reached up a winding country lane, surrounded by acres of lawn and with fabulous views over the rolling Dordogne countryside. Guest accommodation is on the ground floor of two converted barns facing each other across a courtyard. Cooking is done in an airy, well-equipped kitchen on the first floor of one of the barns: there was ample space here for our group of nine. We were a mixed bunch, including a chocolatier, two majors, a tank procurer, a psychotherapist, and a custom lift manufacturer. But what we did have in common was an ability to get excited over things like perfect poached eggs, basil ice cream, fancy kitchen gadgets, and playing with pans of boiling sugar. On the first evening there was a babble of conversation over the welcome meal cooked and served by Jim and his wife Lucy. We didn’t even flag when Jim told us we’d have to reproduce this splendid meal on Friday, we just poured ourselves some more wine. The next morning we found ourselves around the large kitchen work surface, faced with 9 spankingly fresh sea bass and 9 very sharp knives. Jim expertly filleted one to show us how it is done, demonstrating every stage from the initial cut to pulling out the pin bones with tweezers, then literally hand-held those of us who were a bit wobbly when we tackled our own. Thanks to him we ended up with eighteen perfect fillets, and in my case at least enough confidence to try it at home. Each day basically revolves around cooking the evening’s two-course dinner (plus lunch on a couple of days). One of the things that most impressed me was how well-planned the menus were, each designed to include several transferable skills, such as the aforementioned fish filleting, which can be applied to any round fish. 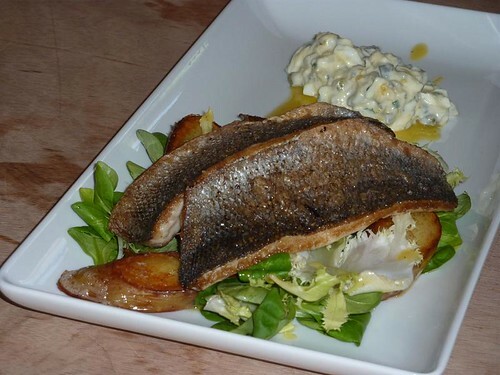 With the sea bass we had sauce gribiche — “tartare with knobs on” in Jim’s words. This gave us an opportunity to make mayonnaise three different ways (food processor, electric whisk, by hand) and compare the results, and to do some “cheffy chopping” of the other ingredients. 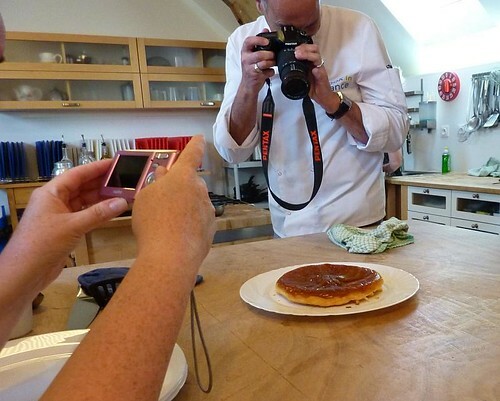 Even dishes I’d done many times before, such as Tarte Tatin, demonstrated by Jim’s assistant Liz, could be eye-opening. 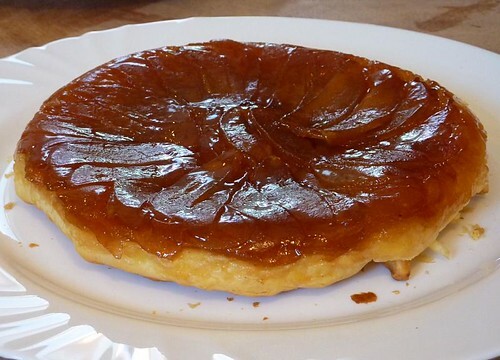 I think my rustic tatin is pretty good, but I was bowled over by the elegance of hers: a perfect, glossy, mahogany coloured disc met my eyes when I turned mine out. I’ll definitely be incorporating her techniques in future; the extra work is worth it. And Jim’s instant method of making custard (used as an ice cream base) is a surefire winner. Jim’s also a goldmine of professional cheffy tips, things you never find explained properly in cookbooks. Perfect poached eggs, cooked in advance and reheated when needed, are now within my grasp, along with real fish stock, fantastically concentrated duck gravy, membrane-free orange segments, nifty tricks for making perfect pastry discs, and much more. I think everyone learnt something; one of my favourite moments was Tony’s “Wow!” as he beat egg whites for the first time ever, producing a silky smooth Italian meringue. And it was fun too, especially the afternoon we spent messing about with hot sugar, producing golden domes, tuiles, and springs. So 80s, but fun to do once in a while. Most of these techniques were used to produce dishes that showcase classic French flavours presented in a stylish modern way, with Jim giving lots of tips on presentation. Everything here is within the reach of a keen home cook: no fancy equipment needed, but you can if you want turn out dishes that wouldn’t look out of place in a fancy restaurant. Some things were ridiculously simple: we all loved the baked camembert with rustic croutons, which is literally 10 minutes’ hands-on work. 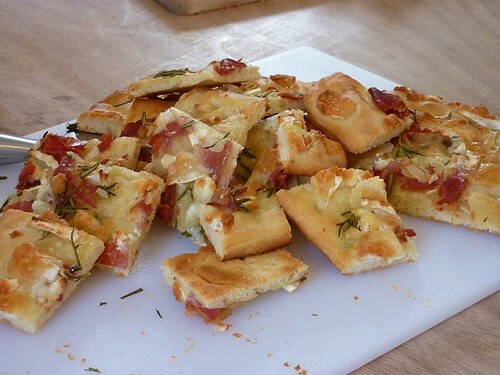 Likewise the fougasse, which made me ask myself why I always think it’s too much bother to do. Our last day was dedicated to reproducing the three-course meal Jim had cooked for our welcome dinner on Monday: chilled tomato and fennel soup, duck confit with peas and pommes dauphinoises, and an elaborate dessert of deconstructed lemon meringue pie with ice cream, red fruit jelly, and the spun sugar tuiles we’d had a riotous time making on Wednesday afternoon. I’ve never made duck confit from scratch before and probably never will again, since I live in a land of easily available duck confit, but it was a learning experience. And making the pommes dauphinoises gave me an “I want one of those” moment when I used a mandoline for the first time — what a lovely bit of kit! 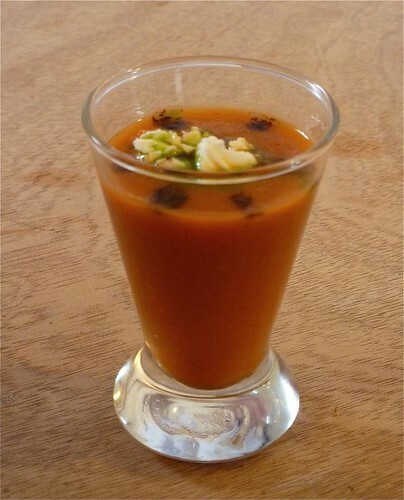 The soup we’d so enjoyed on the first evening turns out to be a doddle to make: prepare a herb-infused ragout of roasted tomato, fennel, onion and orange, which is a great dish in its own right, then liquidise, mouli, and finally sieve to get the perfect smooth texture. For dessert, perfect cylinders of trembling lemon curd perched on crisp pastry disks and finished with a blowtorch, served with the lemon and black pepper ice cream we’d invented a few days earlier, were just superb: total silence descended as we ate them. Although with due respect to Jim, I’ll make conventional crunchy meringues, not Italian ones, the next time I do it. We weren’t tied to the kitchen sink all the time; there were always a couple of hours free during the day to chill by the pool (or in it, very chilly indeed! ), go for walks, or just sit on the lawn and read. On Wednesday Jim and Lucy took us to the market in the beautiful medieval town of Sarlat, a 20-minute drive away. I might be blasé about French markets, but this is quite different from our cheap and cheerful local market: I don’t think I’ve ever seen such a concentration of foie gras and truffles in one place, and the array of locally produced spring vegetables was inspiring. 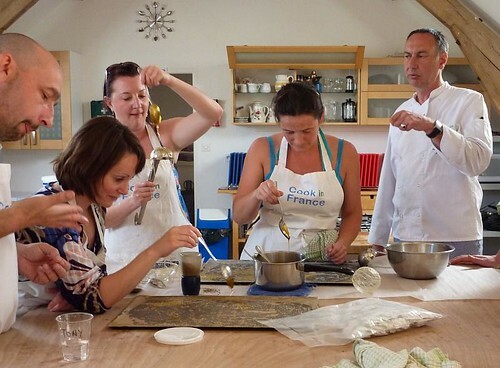 Before I went, I wasn’t sure how I’d take to doing nothing but cook for a week. But having nothing else to do makes it a lot easier than rushing around cooking a meal after a day’s work, and then there was the thrill of cooking a perfect poached egg, or grinding up boiled sweets in the Magimix and feeding them into the candy floss machine (verdict: revolting). We were on our feet most of the time, but there were plenty of breaks, and of course you’re on holiday; you’re free to drop out of a session if you want. Given that I normally spend days alone with my computer, I found spending so much time with other people quite intense, so it was nice to have some space to wander off alone and recharge. And the fact that the only Internet access was via dialup was very effective at removing the temptation to check up on work. I must have been inspired, because when I got back the first thing we did was invite 8 people round for lunch on Easter Monday. 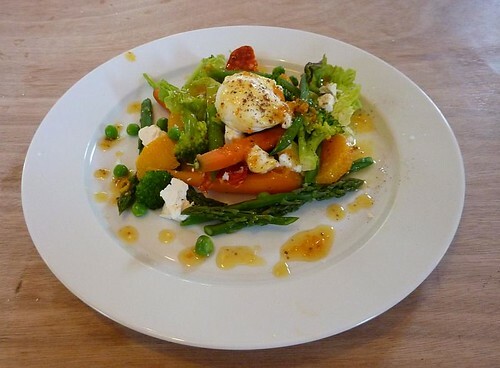 Menu: Jim’s lovely spring vegetable salad with poached eggs and orange and walnut oil vinaigrette; roast leg of lamb with pommes dauphinoises and tomato and fennel ragout; and strawberries and cream. Jim’s tips for preparing things in advance so that you need only assemble them at the last minute proved invaluable, especially for the eggs. And the roast lamb, cooked using Jim’s half-hour cooking method, was fabulous — I have no doubt I’ll always do it like that from now on. I’ve never had a guest take photos of the food at my table before, and lunch ended up lasting till 8:30 pm; testimony to its success! Sounds like an amazing week! I love that he teaches how to fillet fish and work with sugar. Looks like a very informative and delicious way to spend a week in France, and it looks like a gorgeous spot as well. 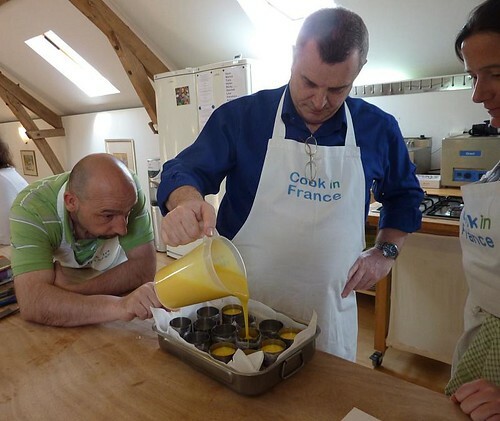 I’ve been to Sarlat and remember the market…foie gras heaven! 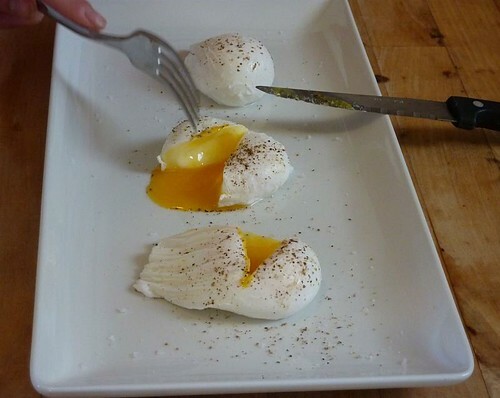 The poached egg looks so yummy!